It's the home of both Princeton and the TV show "Jersey Shore," and its state bird is the American Goldfinch, but what about New Jersey and tea? 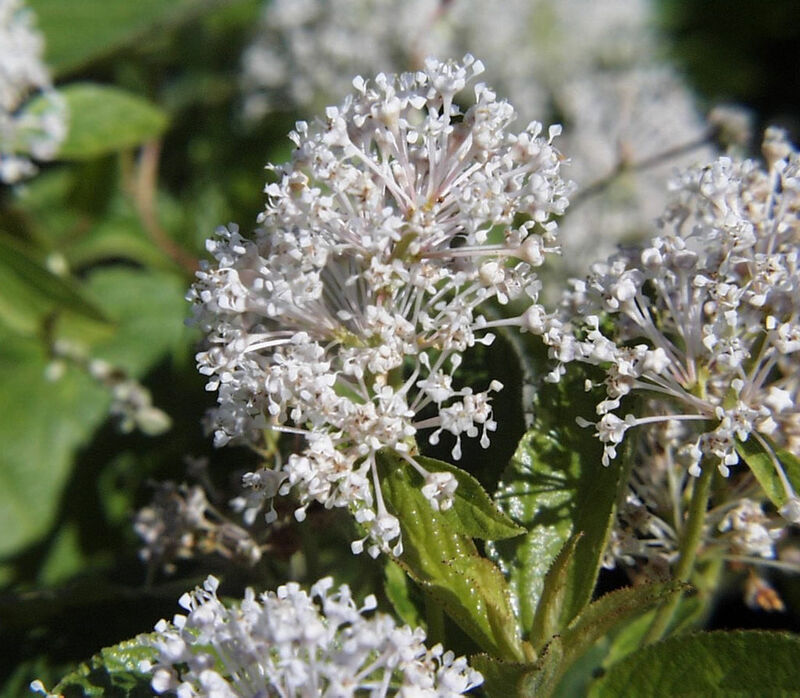 • Did you know there is a plant known as New Jersey Tea? 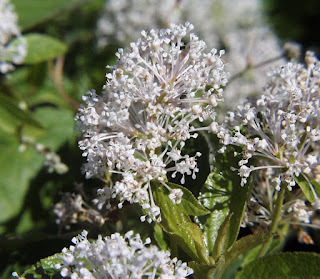 It's actually Ceanothus americanus, a shrub that got its nickname during the American Revolution when its leaves were used as a substitute for imported tea. And despite the name, it grows in many places in the US (click here to read more). • We all know about tea being thrown into the Boston Harbor on December 16, 1773, but I'll bet not many of us know about the great "tea burning" that was held in Greenwich, New Jersey, on December 22, 1774! I came across some info about this 1950 book, now on my wish list, called "Tea Burning Town: The Story of Greenwich on the Cohansey in West New Jersey" by Joseph S. Sickler. When I searched online, I found an article at nj.com that told how, on that evening in 1774, a stolen shipment of tea was set ablaze in the town square! The article says, "To this day, Greenwich’s identity is built around scorched tea as a symbol of courage and independence. The town’s annual charity 5k run is called the Tea Burner Race. Its logo is a flaming crate." Click here to read more of this fascinating tale! • "CAROLINA TEA ROOM. Helen and Jewel, Proprietors. 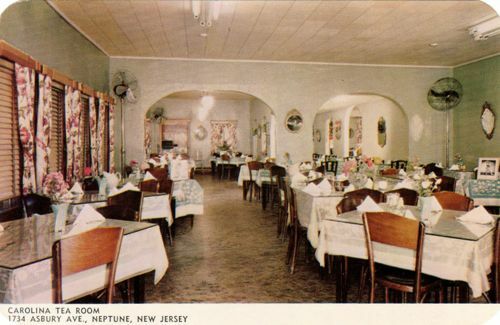 1734 Asbury Avenue, Neptune, N.J. 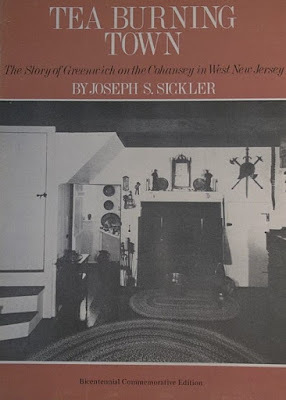 Famous Throughout Jersey For Southern Home Cooking." 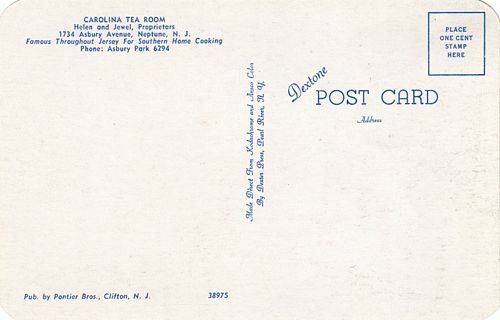 This is one of the postcards from my collection of vintage tearoom postcards, and I still find it intriguing that "Southern Home Cooking" was being offered in this tearoom. 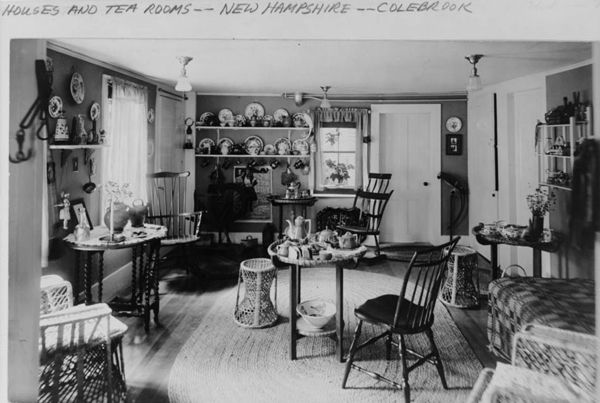 I also find it interesting that the top photo above shows tall electric fans on both sides of the tea room. That's something I picture us needing here in the hot South but not necessarily in New Jersey! Snap! I *think* I already have your correct address, but if you would confirm that for me via the email button at right, that would be great. Congrats, and thanks to everyone who entered! So I was in the mood to try another of my new samples from Teavivre when I decided upon the Moonlight Beauty Raw Puerh Loose Tea. I was expecting the usual dark black and brown, earthy-smelling tea leaves, so when I opened the package and saw this, I thought, "Uh-oh. This sample got mislabeled." Now I rarely have a need to actually *touch* my tea leaves unless I'm photographing a sample for a blog post, as I did here, and the other thing I noticed besides the nice vegetal scent (not one I associate with puerhs at all) was that the leaves were so velvety! I wish you could touch them, because they felt simply glorious! 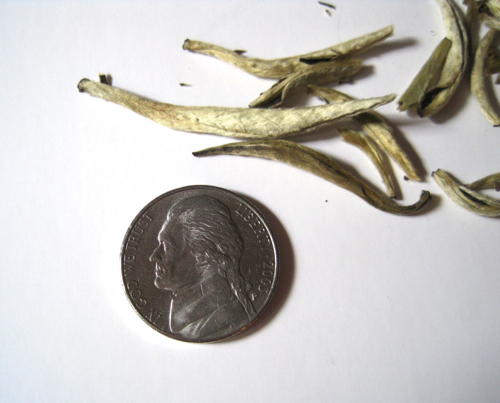 And just so you don't think the leaves are giant ones, here's a coin for comparison. Steeped, the tea had a slightly musky scent, and when I sipped it, the tea seemed very much like a smooth, rich-tasting green, with no bitterness and no puerh taste at all. 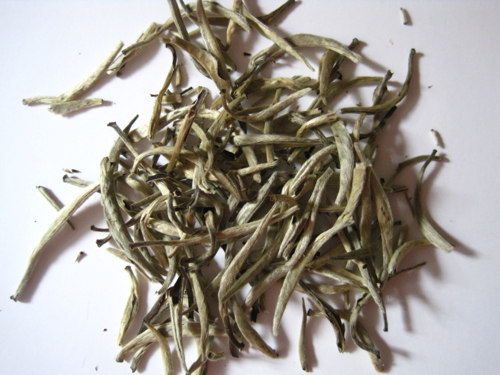 By then I was enormously curious about this new sample and had to go visit the Teavivre site, where I learned the reason for this tea's unique appearance and taste: It is "made from the tender buds of Menghai large-leaf tea in Yunnan and processed with the method similar to White Tea. 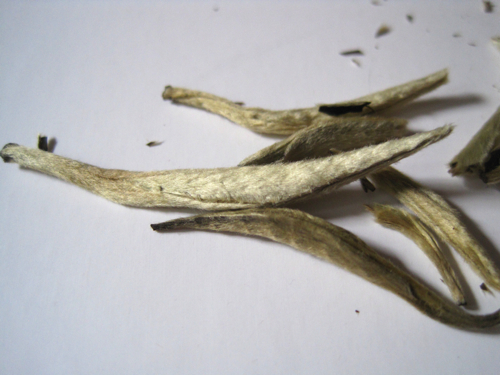 So it belongs to both Puerh Tea (for its material) and White Tea (for its processing method)." 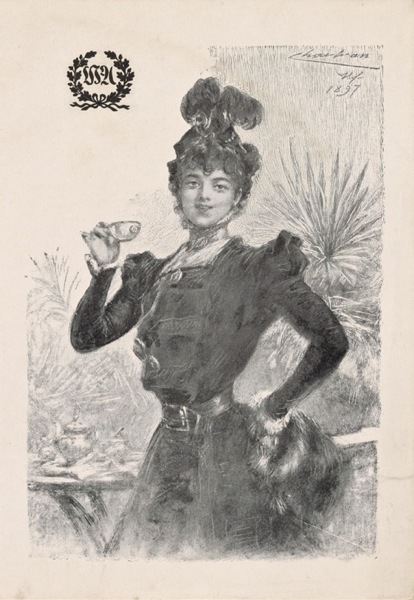 I was also intrigued to find a comment that "Moonlight beauty tea is suitable for women or those tea lovers who prefer a fresh, soft and smooth taste." I must say I agree. 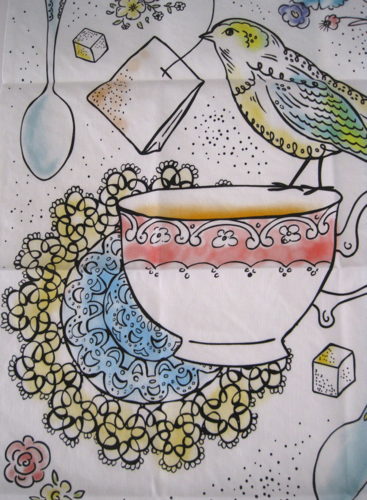 Like many of you, I'm quite fond of tea towels and consider myself a small-time collector of them. 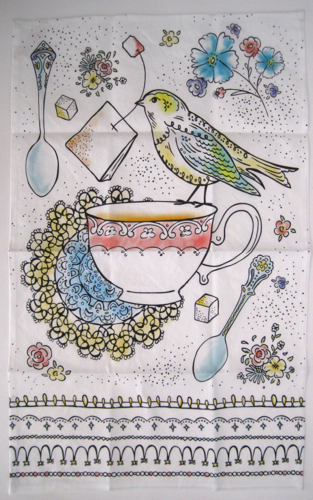 I have vintage tea towels, souvenir tea towels, some lovely modern tea towels, but never before have I owned a tea towel made with love (just for me!) until I received one in the mail this week! The thick, squishy envelope was from tea friend Ginger in North Carolina. Inside was a darling tea towel she made from fabric she found on Spoonflower.com. She washed and hemmed the fabric (something I'd never have gotten around to doing myself), and she told me in her note that it's of cotton and linen, so it can be washed with my regular towels. I absolutely adore this design, and since I am a tatter, I was so tickled that the doily behind the teacup features tatting, which you can tell by the loopy "picots" along the outer edge. And the icing on the cake (or maybe "the clotted cream on the scone"?) 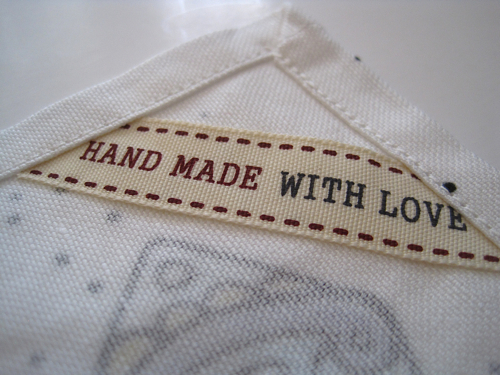 was finding that a little fabric hook had been sewn onto the back of the towel, and that's how I know my beautiful new tea towel was "hand made with love" by Ginger! About this time every summer, I'm dripping sweat during one of my afternoon walks when I start to seriously think, "I can't wait for fall to get here." I've already started spotting the occasional brown leaf on my daily strolls, and I find myself fantasizing about cooler temperatures, warmer clothes, cinnamon scones, and spice teas. 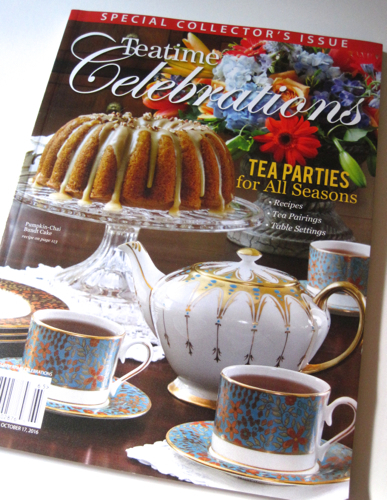 As if reading my mind, Tea Time magazine has come out with another special issue, Teatime Celebrations, that has me even more ready to welcome fall! The teawares in this issue, as always, are incredible. I've long been a fan of Herend (not that I own much of it! 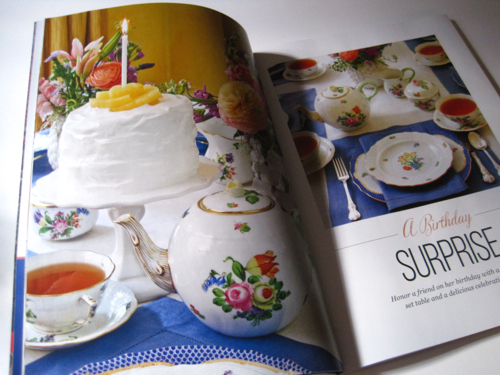 ), so this Herend Printemps china in a feature on a Birthday Surprise Tea immediately caught my eye. 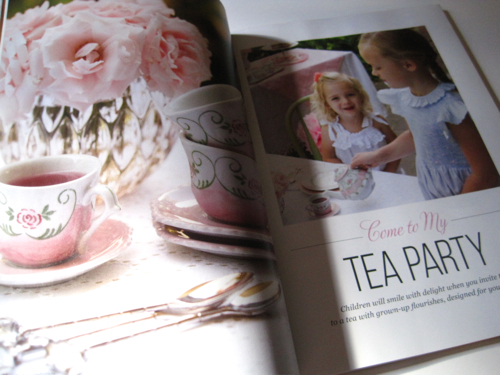 A softer palette prevails in Come to My Tea Party, a feature about a children's tea. Is there anything sweeter than little girls in smocked dresses? But the recipes are what make this issue such a hit with me. 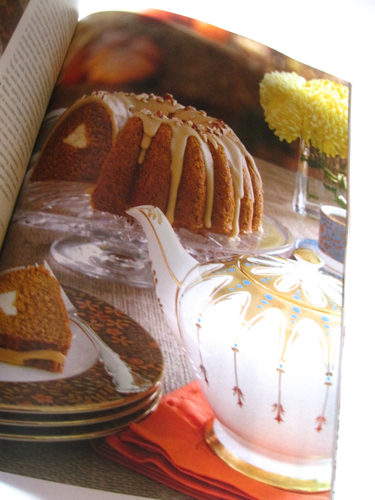 This is the cover cake, a Pumpkin-Chai Bundt Cake with caramel icing. Much as I love to bake using tea as an ingredient, I've never made a Bundt cake with tea in it, and I'm eager to try this one. If you're ready for some fall inspiration as well, this magazine should do the trick! 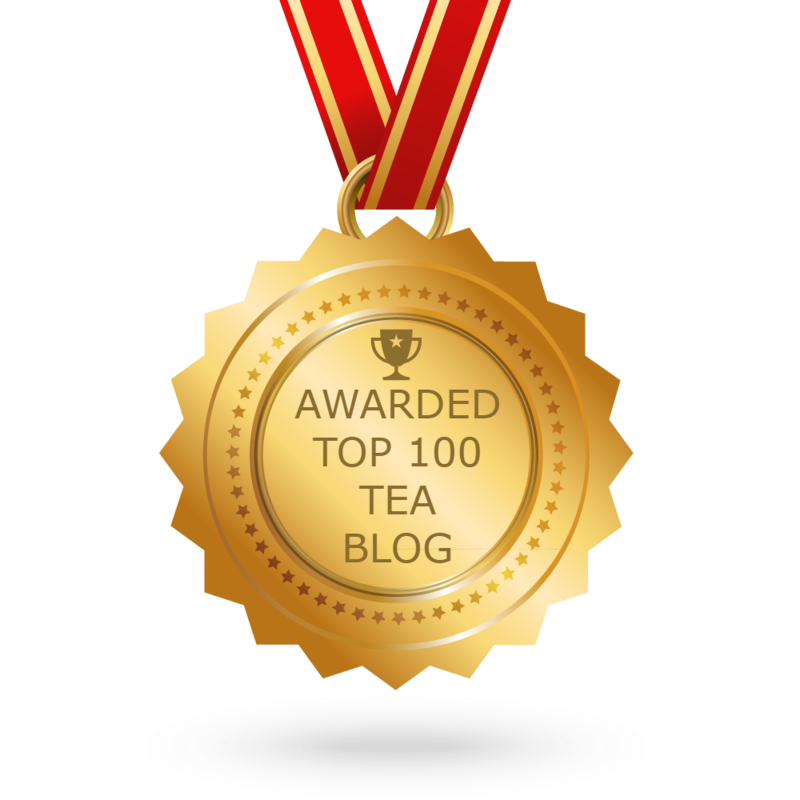 A fabulous gift of some teatime newsletters! 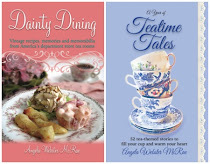 Recently I was contacted by Rose Turner Jory, one of the lovely ladies I've gotten to know through the wonderful Afternoon Tea Across America group on Facebook. She asked if I was still interested in back issues of Mary Mac's TeaTimes Newsletter, which I had mentioned in a blog post back in 2010. Indeed I was, and I quickly wrote back, wondering whether perhaps Rose had found a link to some issues online since folks are posting everything here these days. To my surprise and absolute delight, Rose herself had some of the actual newsletters and was offering to send them to me! 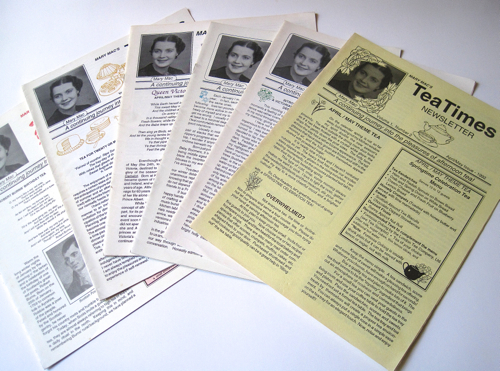 And since I *love* to research anything and everything related to tea, can you even imagine how happy I was to receive these six issues in the mail? I had only one issue of this newsletter before Rose sent me the mother lode of TeaTimes Newsletter back issues, so my research capabilities have increased tremendously! 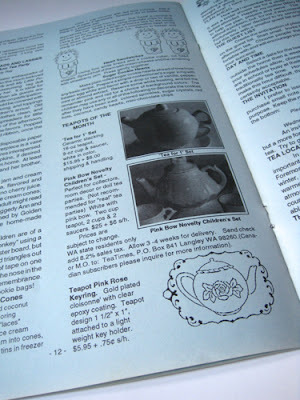 In this February/March 1993 issue, which charmingly featured pale blue interior pages, I read a piece on "Teapots of the Month," which included a tea-for-one set and a Pink Bow Novelty Children's Set. How interesting that 23 years later, both styles are still favored today! I love how each issue featured a themed tea, and in the April/May 1993 issue, that was a Queen Victoria Tea. 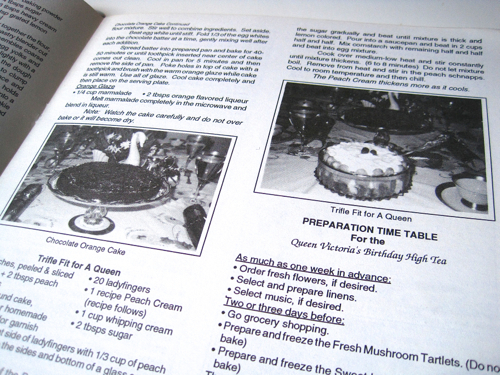 Inside are recipes for such royal treats as Chocolate Orange Cake and Trifle Fit for a Queen. An entire menu is suggested as well. Even the old ads are fun to read! 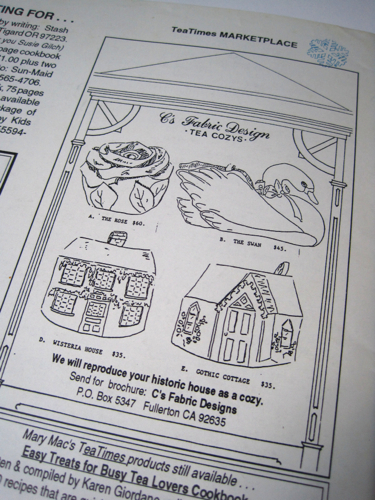 In this one, for "C's Fabric Design," the offer is for tea cozies and comes with the note that "we will reproduce your historic house as a cozy." Now how wonderful is that! As you can probably tell, I am having great fun going through these back issues Rose so generously shared with me, and I'll probably have more to say about them as I continue to pore over them in the days ahead! 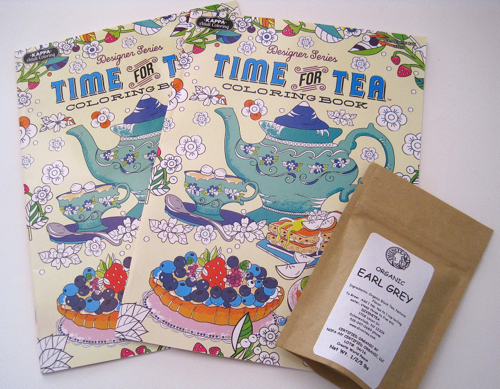 July giveaway: Coloring books and tea! 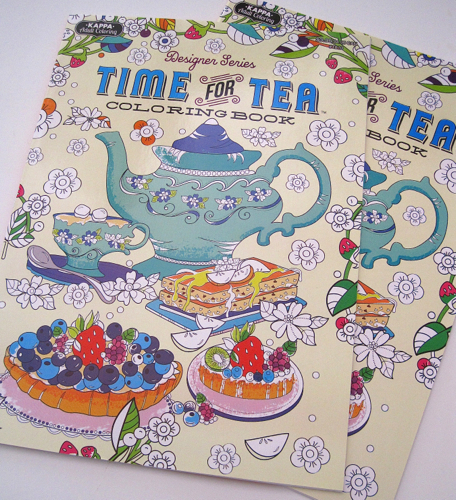 I had just about given up hope of finding anything suitable for July's giveaway when I came across some fun "Time for Tea" coloring books at Dollar Tree over the weekend. I'm giving away two — one for you to keep, one for you to share — and a package of Divinitea's Organic Earl Grey tea. 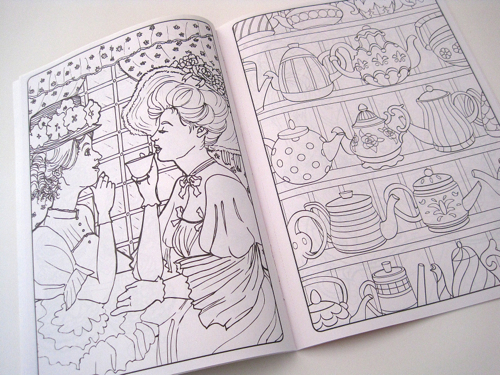 In my mind, I've pictured two friends, or perhaps a grandmother and granddaughter, coloring away while sipping cups of Earl Grey, which I think would be just lovely! I have really grown to love Dollar Tree because I just never know what I'll find there. I've learned to always check out their book selection, and this weekend, I once again found some wonderful hardbacks from favorite authors. On the way to the books, I spotted these coloring books. Yes, they're thin, and when I counted, I realized they have just 32 pages each, but hey, for only a dollar, that's what, 3.125 cents per coloring page? Not bad. So if you'd like to be entered to win, just leave an "Enter me" to this post before 7 a.m. EST on Friday, July 29, and tell me what you would do with the second coloring book (give it to a friend or share with a grandchild, for instance), and you'll be entered to win. US and Canada only, please. Good luck! • For the second time this month, I have learned of some interesting tea research being conducted at a university here in the US. According to a segment on New Hampshire Public Radio in September of 2014, some genetic engineering of tea is under way at the University of New Hampshire, where a neuroscience major has been working to create a *genetically decaffeinated* tea plant. "If all goes as planned," the reporter says, "the tea from this plant will produce a more aromatic brew than chemically decaffeinated tea." 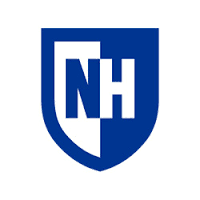 If you'd like to read the full transcript for yourself, or to listen to the radio segment about the UNH project, click here. I'm still having fun sipping my way through my stash of girlfriend-supplied tea samples, and a new one I tried this week was Republic of Tea's Cuppa Chocolate Tea Coconut Cocoa flavor. 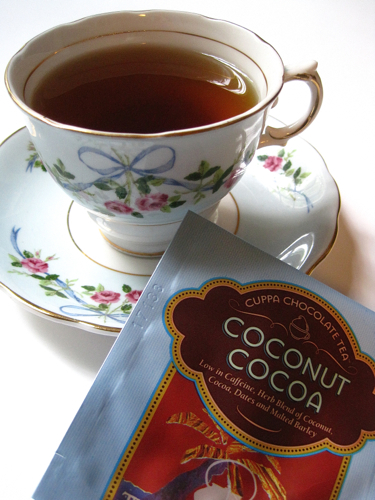 This low-caffeine herbal blend contains coconut, cocoa, dates, and malted barley. As soon as I opened the packet, I detected a delightfully chocolaty scent. I'm happy to report that the rich chocolate flavor was one worthy of such a great scent, and I very much enjoyed discovering a fine new dessert tea. 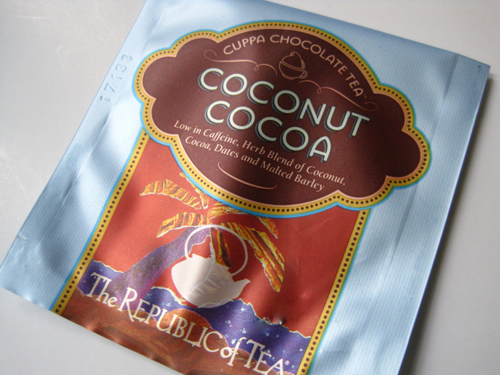 Have any of you tried these Republic of Tea chocolate blends? Are there any other new varieties you'd like to recommend? 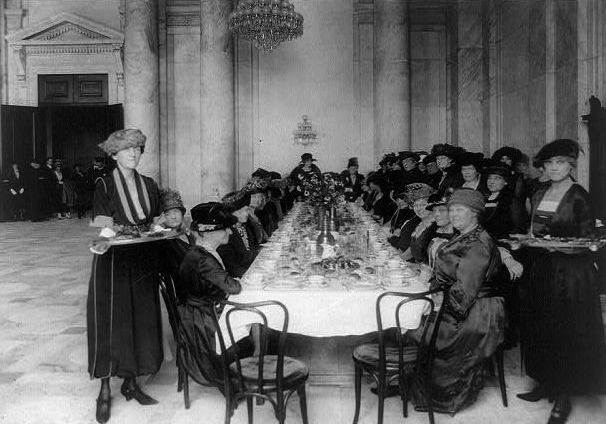 Another of the photos I recently came across on the Library of Congress website was this charming photo titled "Senate ladies' tea, Washington, D.C." The photo is from December of 1920, and one of the subject headings is "legislators' spouses," so I'm assuming we're looking at the wives of the senators at that time. I wish they had more detailed photos from the tea! I tried to zoom in on the table with my photo-editing program, but that didn't work, so I'll just have to leave it to our imaginations to ponder precisely which glassware and china the "Senate ladies" enjoyed using nearly a hundred years ago! When "Murder, She Wrote" with Angela Lansbury first came out in the eighties, I was in college and more interested in keeping up with Madonna and getting MTV installed in the dorms. As an adult, however, I have become quite the fan, and the DVDs of old episodes are my guilty pleasure for weekend viewing. When I learned that a series of cozy mysteries had been written by "Jessica Fletcher and Donald Bain," I decided to try one, but frankly, I was skeptical. It would be very hard to capture that gracious character's wit and charm in a book, I thought. Over the weekend, I finished reading "A Slaying in Savannah," book number 30 of 43 in the series, and to my delight, it was wonderful! 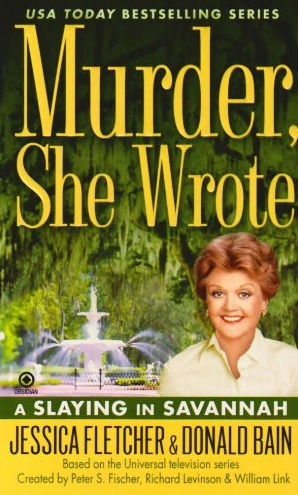 I could truly "hear" Jessica Fletcher saying that dialogue, and it didn't hurt that I decided to dive into the series with a book set in Savannah, a city with which I'm already familiar. • "'I was just making myself a cup of tea,''' I said, turning back to the stove. I removed the tea bag from my cup and threw it away. I resisted offering the Grogans any tea. It would mean a long conversation and I was feeling tired again." 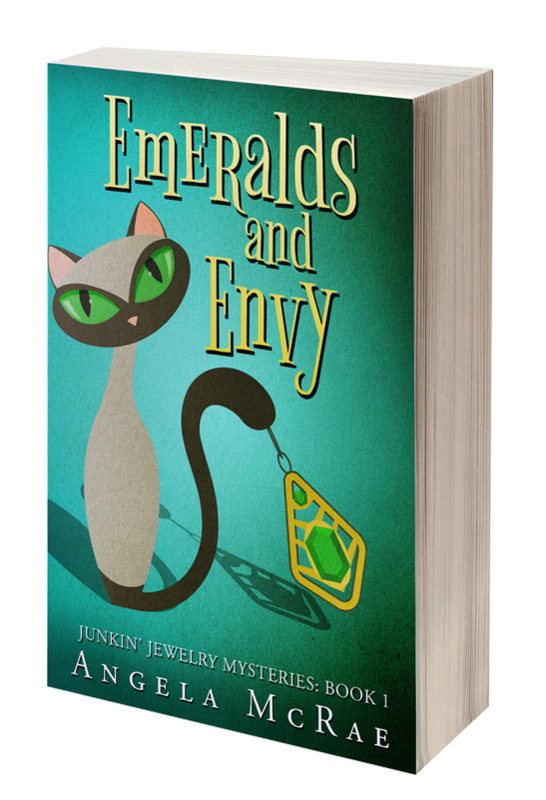 • "Mrs. Goodall walked in a few moments later with a tray holding the ice pack, a cup of tea, and two cookies cut in the shape of a shamrock and sprinkled with green sugar." • "The waiter delivered a pot of tea and a slice of Lady Baltimore cake, 'compliments of the baker.' 'He’s experimenting with a new recipe,' he said, placing the white cake with fluffy icing on the table." I'm so happy that I have more of these books to look forward to. Are any of you fans of "Murder, She Wrote"? Call me late to the party, but over the weekend, it dawned on me that after owning an iPhone for three-plus years, I should look for a tea-themed wallpaper for the homescreen. The Shabby Tea wallpaper is the one I chose, and I just love it! You can find lots of these wallpapers—for iPhones, iPads, and more—on Pinterest. 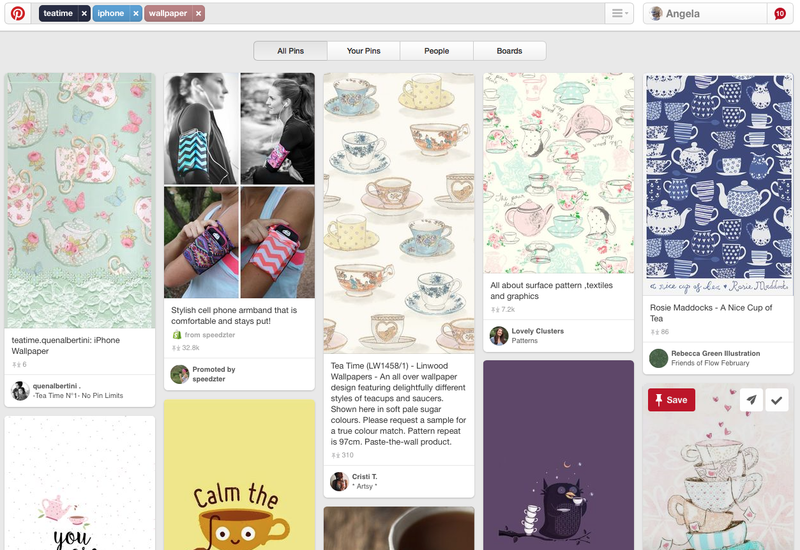 Here, I simply typed in keywords "teatime iphone wallpaper," and here are some of the images that came up. As you can see, the aqua and pink one appealed to me immediately, but there are lots of great designs to choose from. 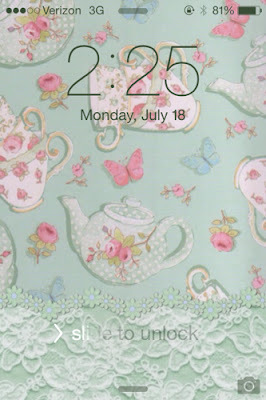 Do you have any tea wallpapers on your electronics? 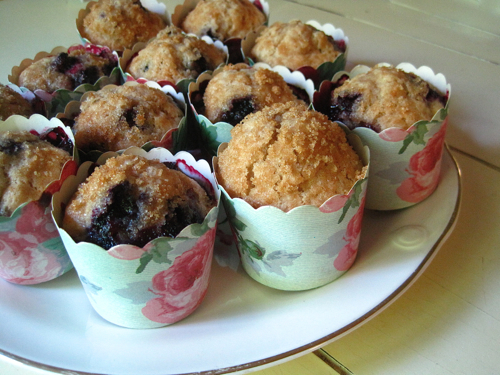 My dad has been sending me home with lots of fresh blueberries lately, so when it was time to bake something for our Sunday School breakfast social over the weekend, I decided to experiment with a new muffin recipe. 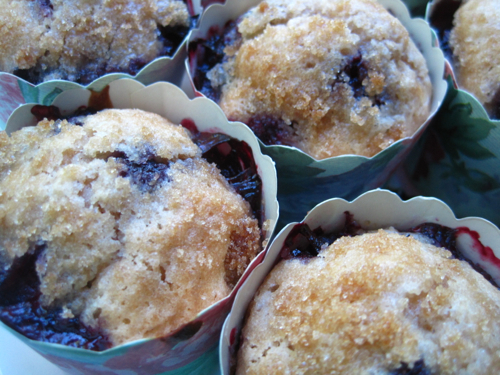 I decided to add cinnamon to my blueberry muffins, top them with brown sugar, and the result was a muffin I believe I'll be enjoying for quite a while to come. Maybe you too? Preheat oven to 400 degrees. In a medium bowl, add flour, sugar, salt, baking powder, and cinnamon and mix well. In a 1-cup glass measuring cup, add the vegetable oil, egg, and enough milk to bring the total contents of the measuring cup to 1 cup. Add vanilla and blend well. Add wet ingredients to dry ingredients and mix lightly, just till combined. Fold in blueberries. 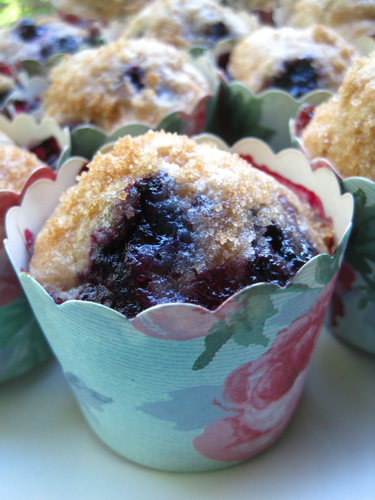 Divide batter among paper muffin cups, sprinkle with a scant teaspoon or so of brown sugar, and bake for 17-20 minutes or until a toothpick or tester comes out clean. Yields 12 muffins. 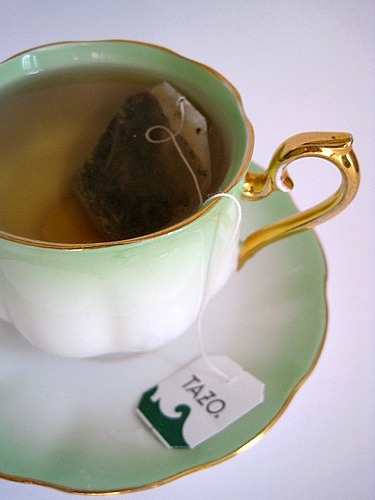 • Davidson's Organic Teas is based in Reno, Nevada, and has an outlet store in Sparks, Nevada. Are you familiar with this company? A friend introduced me to Davidson's years ago, and I'll forever be a fan because of their amazing line of dessert teas, which are delicious herbal blends that taste like calorie-free desserts! In fact, I visited their website and saw they've added a few new flavors since I last tried them. 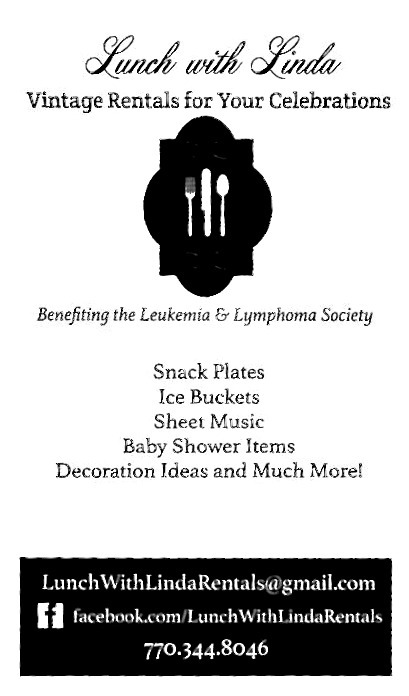 If you'd like to check them out too, click here. • Las Vegas, Nevada, is the site of the World Tea Expo. This year's expo just wrapped up, and the next one is set for June 12-15, 2017 at the Las Vegas Convention Center. According to worldteaexpo.com, this event is "the epicenter of the North American specialty tea market (and) serves the $8 billion US tea industry. Specialty/premium tea is driving this growth and holds nearly 60% of the marketshare today; it remains the main focus of products, services and education at World Tea Expo." I think it's also worth noting that the United States League of Tea Growers had its founding meeting at a World Tea Expo in Las Vegas, the one in June of 2013, so a lot of great things related to tea and teatime come out of these expos. 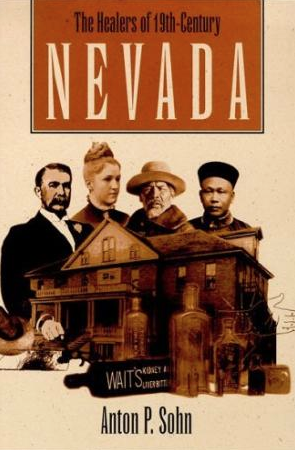 • Herbal teas were used as remedies in 19th century Nevada. Actually, herbal teas have been used as remedies in lots of places, but I read about these particular ones in the book "The Healers of 19th-Century Nevada" by Anton P. Sohn. 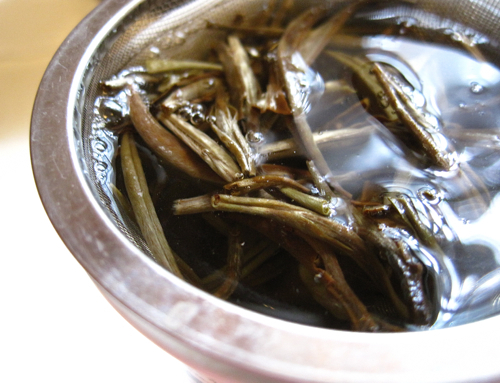 If you'd like to see what Indian tea or Mormon tea (Ephedra Nevadensis) was used to cure, I'm not going to type the words here — not because I'm scandalized by the words themselves but simply because of all the unwanted spam I'm afraid would land in my blog comments —you may click here to find out for yourself! After trying a disappointing peach-flavored tea earlier this week, I was only too happy to experience a nice fruity taste in this tea I recently received as a sample. Tulsi, also known as Holy Basil, is said to be revered in India as a sacred, healing herb. 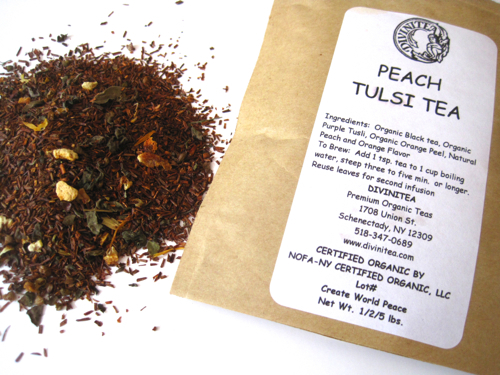 This Peach Tulsi Tea blend from Divinitea contains organic black tea, organic purple tulsi, organic orange peel, and natural peach and orange flavor. 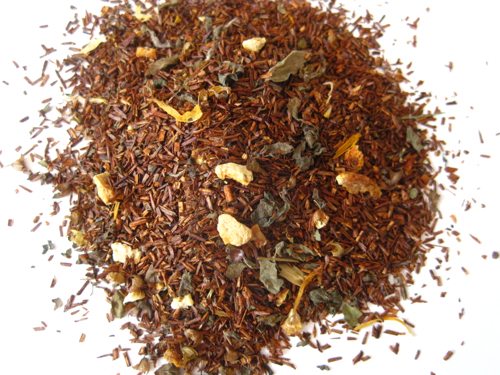 The tea looks very much like a rooibos, doesn't it? The nice coppery brew that resulted was a perfectly satisfying cup of tea, with a light (but distinct) peach taste, a soft sweetness, and its flavor reminded me of a rooibos as well. A pleasant end to the week in tea-tasting! Each week, as I'm looking up info on the history of tea and teatime in America, I come across great old images that I love to share. I'm so grateful to find these images in the public domain, and I also think some of these images might find their way onto tea party invitations, tea tote bags, tearoom walls, and who knows where else! 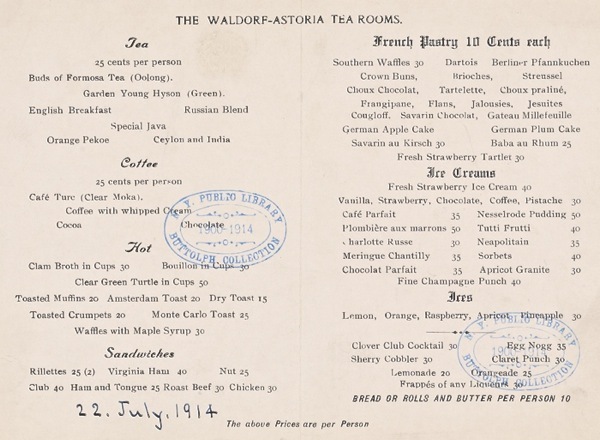 The 1914 image up top is from a menu at the Waldorf Astoria, and here is the inside of the menu. I'm surprised to find that tea was 25 cents per person (pretty pricey for back in the day), and I'm also surprised to see "Buds of Formosa Tea (Oolong)" and "Garden Young Hyson (Green)" teas on the menu. Are you? But the menu item that puzzled me most was under the heading "Hot," and it reads, "Clear Green Turtle in Cups." I'm guessing this is turtle soup, and if so, no thank you. I'll stick with a pot of tea and one of the French pastries, perhaps the Choux Chocolat. (And I'm amused that the French pastries included "Southern Waffles.") So what would you order? 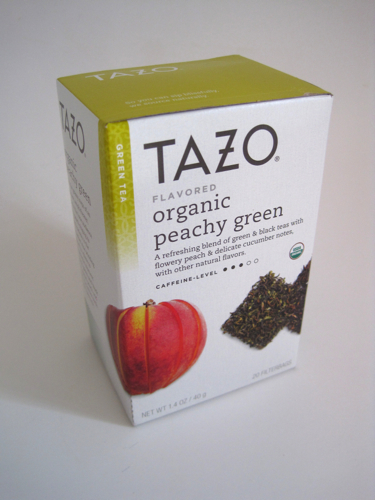 So the grocery store had this Tazo Organic Peachy Green flavor of tea on sale for just $2.99 a box this week, and I thought I'd give it a try. 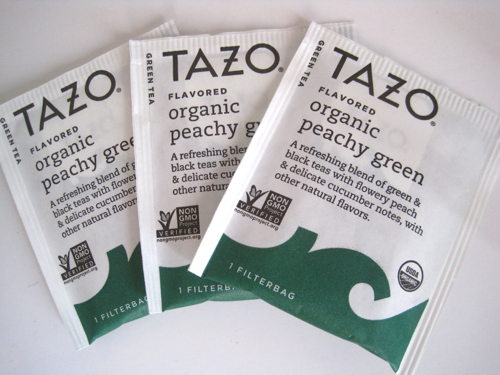 A blend of green and black teas with peach flavor? Sounded interesting. "Flowery peach and delicate cucumber notes," it said. A) I want my cucumber in sandwiches, not my tea and B) Peach and cucumber? 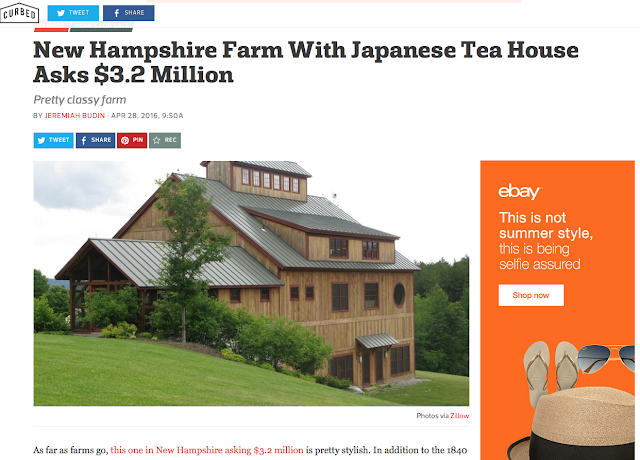 I didn't read that part or I might not have been so quick to purchase this bargain tea. But here's the thing: this tastes like plain tea. No peach flavor that I could detect, and certainly no cucumber. It's not bad, exactly, and maybe it was simply past its sell-by date, but it's just not the flavorful tea I paid for and expected to sip. So this will go into my "mystery iced tea" collection. This summer, I've been having a fun time using up bits of leftover teas and blending a new iced tea every few days. I've sipped iced greens and blacks and rooiboses, and occasionally I've even blended plain black and green teas with some fruit-flavored tea bags. It's not a bad way to use up tea that's lost its luster. Like this one. 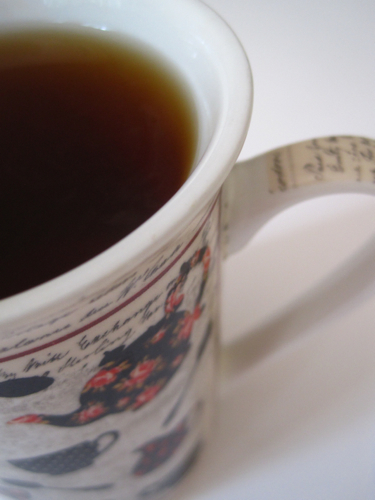 What do you do with old or less-than-sparkling teas? Do you ever make iced tea with them? 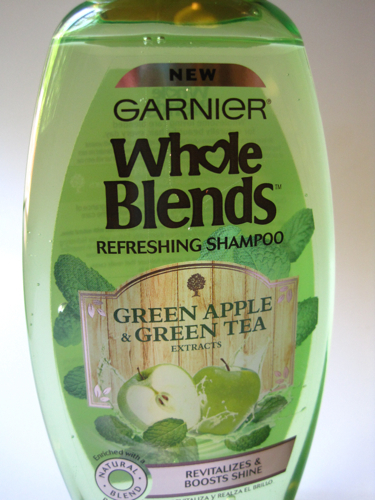 Unable to find my usual shampoo and conditioner this weekend, I searched Kroger for something new and came across the Garnier Whole Blends Shampoo and Conditioner with Green Apple and Green Tea Extracts. I wasn't too crazy about the scent of some shampoo I bought recently, so I decided that since these products were on sale (two for $7), they would be worth a try. First, however, I sniffed, and the scent was light and lovely, so these jumped into my grocery cart. 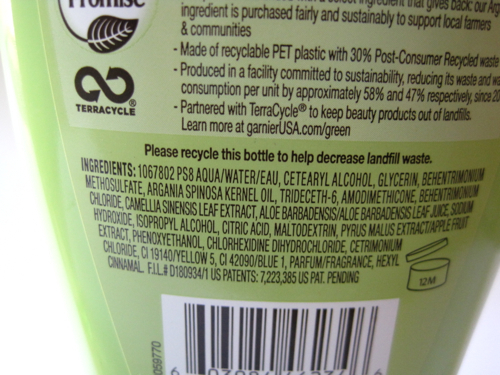 And, indeed, both products list "camellia sinensis leaf extract" as an ingredient. 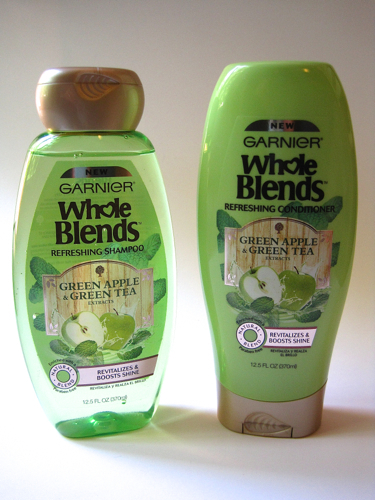 The conditioner also left my too-dry hair feeling nice and soft, so I was grateful to have come across these new haircare products! The gift of a charming new tea mug!